Pakistan's minority Hindu community leaders have asked Prime Minister Nawaz Sharif to accept their demand for a public holiday on Diwali and announce a special aid package for them on the festival. Pakistan Hindu Council Patron-in-Chief Dr Ramesh Kumar Vankwani, also a ruling party legislator, said that grant of a holiday will help reduce the community's sense of deprivation. "We are patriotic Pakistanis and it is our constitutional right to have a public holiday on our annual festival," he said. Vankwani said he would raise the issue in the National Assembly. "No political party is interested in resolving the issues of minority communities in Pakistan," he said. He said official holiday is observed on Diwali, which will be celebrated on October 23 this year, in over 10 countries including Malaysia, Nepal, Sri Lanka, Myanmar, Mauritius, Guyana, Trinidad and Tobago, Suriname, Singapore, Fiji, India and Bangladesh while in Pakistan Hindus who do not attend offices on that day are marked absent. The Pakistan People's Party-led government had introduced a package of Rs 10,00,000 for each Hindu lawmaker for distributing among their communities on Diwali. Vankwani said the PML-N government led by Prime Minister Sharif should continue the tradition. He said the government should ask all public and private organisations to offer packages and advanced salaries to Hindus on Diwali. Scheduled Caste Rights Movement Pakistan Chairman and Director Hare Rama Foundation Ramesh Jaipal said that the announcement of a public holiday is a must to make Hindus feel that they are part of the society. He said Hindus were among the most underprivileged groups in Pakistan and therefore needed special attention of the government. 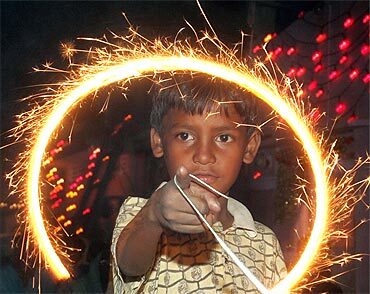 "The government should announce an economic package for Hindus on Diwali, as it does during Ramazan," he said. "Yousaf Raza Gilani was the first prime minister to congratulate the Hindu community on Diwali. We expect it from the incumbent government too," he added. A Hindu religious leader Guru Sukhdev G said Diwali gives the message of love and brotherhood. "There is a need to spread this message to ward off the threat of extremism in the country. The government should own this occasion to spread the message," he said. He said the government should encourage all communities including Muslims and Christians to participate and share the occasion.